The TD-2000 Series of compact powered desktop thermal printers bridge the gap between desktop and mobile printers for producing labels, tags and receipts up to 2.2" wide practically anywhere. They offer the performance, features, and media capacity of desktop printers but can also be powered by a rechargeable battery pack and print wirelessly on a cart, in a kiosk, or virtually anywhere you need work. 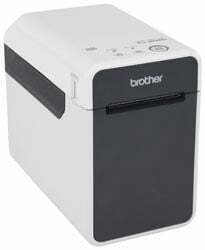 Direct thermal printer with a 4.33" print width, and 200 or 300 dpi.